Ethiopia is renowned as the birthplace of coffee, it is the only place in the world where coffee is an indigenous plant. All other coffees in the world are descended from Ethiopian coffee plants. More than fifteen million Ethiopian households are dependent on coffee for income. There are more than 1.2 million coffee farmers in the country, with 92% of the coffee produced by small-scale farmers. Ethiopians have cultivated coffee for more than 2,000 years with nearly 3,000 different coffee varieties. Ethiopian coffees are unforgettable, and a favorite among coffee connoisseurs. This dynamic destination will introduce you to the remarkable and colorful tribal communities in southern Ethiopia and numerous UNESCO World Heritage sites in the north that can boast 17 centuries of Christian tradition. Round trip non-stop flight aboard Ethiopian Airlines new Boeing 777 inclusive of fuel surcharge and air tax from Washington D.C. to Addis Ababa. Four internal Ethiopian flights inclusive of fuel surcharges and taxes. Private tour of the Sidama Coffee Farmers Cooperative. Private tour of the Yirgacheffe Coffee Farmers Cooperative. Enjoy special seating at the Ethiopian Coffee Commodity Exchange in Addis Ababa. Visit four distinct tribal villages and be amazed of their lifestyle, social infrastructure that is reminiscent of bygone eras. 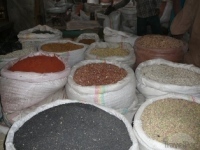 Visit the colorful weekly Key Afer market, a congregation of various tribes trading their wares. Cruise on Lake Chamo for an up-close look at hippos and crocodiles. Cruise Lake Tana with its 37 islands, 30 islands have churches and monasteries. Visit two UNESCO World Heritage Sites. Gondar, considered the "Camelot of Africa", an old imperial capital from 1635. Lalibela the "Petra of Africa", known for its majestic 12th century rock hewn churches. Addis Ababa, with its spectacular museums and churches. Private seating at the Ethiopian Coffee Commodity Exchange in Addis Ababa. Traditional Ethiopian dinner with entertainment at a local restaurant. Farwell dinner at a private home (Villa) hosted by coffee executives. Hope For Children Volunteer Work at an Addis Ababa orphanage - accommodations at the InterContinental Hotel. Depart from Washington D.C. (Dulles Airport) late morning for your non-stop flight to Addis Ababa, aboard Ethiopian Airlines new Boeing 777 to Addis Ababa, Ethiopia. Arrive early this morning and be transferred south of Addis Ababa to Debre Zeit to check in to the Kuriftu Resort and Spa. Surrounded by Lake Kuriftu on one side and beautiful tropical gardens on the other; this is a slice of paradise. Enjoy Lakeview rooms with spacious terraces. After lunch, relax at this secluded truly romantic environment. However, there are optional activities that you may wish to pursue; canoeing, power boating, fishing and horseback riding. Join your fellow travelers for a Welcome Reception prior to dinner at the resort restaurant. 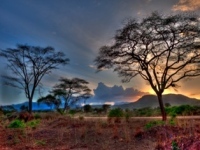 This morning board your 4x4 vehicle and drive south into the Great Rift Valley, passing wonderful scenery highlighting large lakes to the town of Awassa. Late this morning visit Lake Ziway which offers a variety of bird life and view local fishermen plying their trade on the lake. Enjoy lunch at a restaurant on the shores of Lake Awassa. Continue south to the small town of Yirgalem to check-in late this afternoon at the Aregash Lodge nestled between coffee fields and lush vegetation. The bamboo thatched Tukuls are built in the style of a traditional Sidama Village decorated with vibrant colors. A delightful home base for the next two nights. This morning drive to the center of Sidama Coffee Farmers Cooperative Union. SCFCU is a skilled organization with the responsibility of processing support, marketing, and the commercializing of coffee for 45 cooperatives comprising nearly 87,000 farmers. It is well known for its production of garden coffee. Sidama produces approximately 35,000 tons of high quality Organic Arabica beans per year on 70,000 hectares of land. Explore the farm land walking through coffee farms which are homesteads. The harvesting period for the Sidama Coffee is from September to December. Harvesting is mostly done by family labor who hand-pick cherries which are sorted before pulping and sold to the primary cooperatives for wet processing. 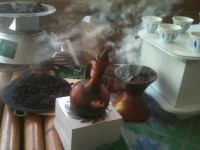 More than 30 percent of the country's washed coffee comes from the Sidama area, which is known for its floral flavors. This morning drive to the Yirgacheffe Coffee Farmers Cooperative Union. Enjoy a guided tour walking through the coffee farms. The Union represents 43,794 farmers and you will learn why the Yirgacheffe coffee is different from other Ethiopian coffee varieties. These local farmers produce 10,000 tons of coffee per annum. Some of the farmers also produce 4,000 tons of Sidamo blend coffee. The coffee cultivation practice here is organic and the coffee trees are managed by hand and fertilized with organic matter. Also learn about the washed and sundried coffee process. After your visit, drive south to Yabello and check in to the Yabelo Motel. After breakfast, we drive to Turmi, along the way visiting the Cushitic speaking Erbore tribe and their villages. The Erbore people are well known for adorning themselves with beads and aluminum jewelry. Arrive into Turmi, a small town, which is our base to visit a Hamer tribal village. Hamer's have remarkable hairstyles made from ochre, water, and binding resin. They rub the mixture into their hair then twist the strands repeatedly to create coppery- colored locks. This is a sign of wealth and status. In addition, this tribe is considered to be masters of body decoration. Check-in to the Buska Lodge. Drive south this morning to the small town of Key Afer for the weekly tribal market. This is a colorful and intriguing experience where you will witness the Ari, Bena, Tsemay and Hamer tribes trade their goods. After lunch visit the Konso Tribe, known as a pagan society. View the eerie wooden totems replete with phallic symbols over the graves of the dead. Within the tribe there are numerous cults based around the breeding and veneration of serpents. 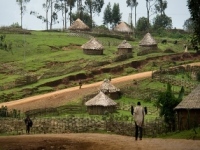 The cornerstone of the Konso culture is a highly specialized and successful agricultural economy. Learn of a culture that has had very little outside influence before continuing to the town of Arba Minch to check into the Paradise Lodge. After breakfast enjoy a refreshing boat trip in one of the Great Rift Valley twin lakes on Lake Chamo which is separated by a ridge called the â€œ Bridge of Godâ€, which is home to huge crocodiles, hippos and a variety of birdlife. 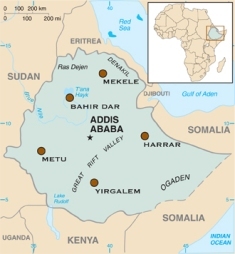 After lunch, transfer to the Arba Minch airport for your flight to Addis Ababa, connecting with another short flight to the lake town of Bahir Dar. Check-in to the Kuriftu Resort and Spa splendidly located with views of Lake Tana. Bahir Dar, is a pleasant city located on the shores of Lake Tana, the largest lake in Ethiopia. This morning travel to the Blue Nile Falls. 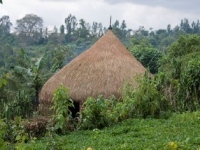 Walk to a village and visit the Woito Tribe and learn about their lifestyle. After lunch cruise on Lake Tana with its 37 islands of which 30 of them have churches and monasteries. Visit the 13th century Monastery of Ura Kidane Mihret with its beautiful painted maqdas. Early this morning drive north to Gondar once the old imperial capital founded in 1635 by Emperor Fasilides, who built a palace and seven churches. The subsequent five Emperors built their own respective palaces. Referred to as the Camelot of Africa, visit the royal enclosure containing six castles, a complex network of connecting tunnels and raised walkways. Proceed to the fascinating Debre Birhan Selassie Church with its walls and ceiling decorated with scenes of Biblical lore and medieval history. Visit the Falasha village and Synagogue, people who embraced Judaism as a religion when it first arrived in ancient Ethiopia in 500BC. 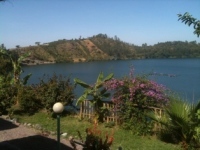 Overnight at the Hotel Goha which stands on the crest of a hill with a commanding view of Gondar. Early this morning enjoy a short flight to Lalibela, which is one of the best kept secrets of rock churches, nicknamed the "Petra of Africa". Ethiopia's Emperor Lalibela, who had visited Jerusalem, attempted to build a New Jerusalem in response to the capture of Jerusalem by Muslims in 1187. Only its relatively remote location and international obscurity keeps Lalibela from seeing the same levels of visitors to Petra. Visit the twelve majestic rock hewn Churches, some of which are still utilized for services. Late this afternoon, check-in to the Mountain View Hotel. After a leisurely morning fly to Addis Ababa, arriving early afternoon. Enjoy a half-day tour with a visit to the National Museum, whose most important exhibit is a replica of the skull of Lucy, a woman who had lived in Eastern Ethiopia about 3.5 million years ago. Continue to visit Trinity Cathedral, the largest and most revered of all the churches. After checking into the Inter Continental Hotel, enjoy a traditional Ethiopian dinner with entertainment at a local restaurant. After enjoying a morning of leisure, this afternoon transfer to the Ethiopian Commodity Exchange Headquarters. The Ethiopia Commodity Exchange (ECX) is an organized marketplace, where buyers and sellers come together to trade coffee. During the afternoon session there is a free trade activity where coffee producers and exporters will attempt to consummate business deals. Our group will have a place in the hall and before the traders start their work, the marketing and communication Manager of ECX will give a brief explanation about the buyers and sellers executing their day to day activities. At 2:30 pm one of the tour participants will Ring the bell to commence the trading day at the Coffee Exchange. Late this afternoon enjoy a farewell dinner at a private home (Villa) and be hosted by Ethiopian coffee executives. Early this evening transfer to the airport for your late night flight to Washington D.C.
After enjoying a farewell dinner at a private Ethiopian home return to the InterContinental Hotel. Your next 48-hours will provide a mutually rewarding volunteer experience-one that enriches your visit to Ethiopia while at the same time making a meaningful contribution to the lives of the children at Hope for Children. This morning transfer to the School of St. Yared whose mission statement is to empower the poorest and the brightest children with a quality education. After an orientation briefing in the logistics of running a volunteer organization, embark on a tour of the School and the Youth Center. Have lunch with the HFC staff members and teachers and plan a schedule for your return visit tomorrow to assist in teaching the children. This may range from you teaching the children English, improving their computer skills or participating in their art classes. This afternoon visit an HIV clinic and talk with clinic administrator to better understand where hospice patients come from and the successful implementation of programs by the Ethiopian Health Minister. Return to the school this morning and embark in immersing yourself with the children. Participate in teaching the young Ethiopians in working with their respective teachers. One moment, you assisting them with their computers, later on in the day be up front and center teaching English. Some poignant moments may find you sitting with a child on a â€œone on oneâ€ basis to improve their mathematical skills. Perhaps during the day venture into the school's kitchen and witness the preparation of nutritional meals; you would be amazed how â€œone dollarâ€ goes a long way in feeding the children. Enjoy a farewell dinner with the children before you depart to the airport this evening for your overnight flight to Washington D.C. This package is currently unavailable. Please check back later or call ET African Journeys for more information.